Beatrice Kaldun, the UNESCO country representative in Bangladesh speaks at the 'Global Media and Information Literacy Week 2018' at EWU campus, Aftabnagar in the capital on Tuesday. 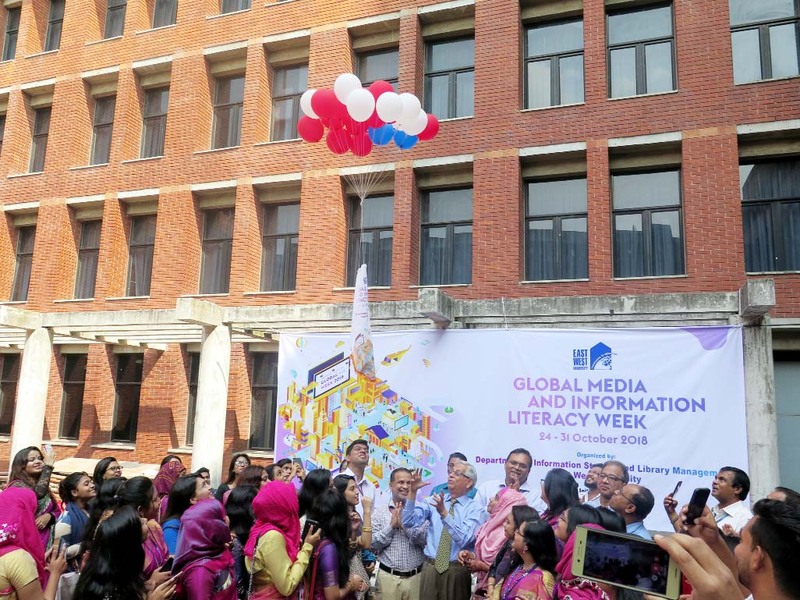 Department of Information Studies and Library Management (ISLM), East West University (EWU) celebrated the 'Global Media and Information Literacy Week 2018' at EWU campus, Aftabnagar in the capital. The yearly Global Media and Information Literacy Week initiated by the United Nations Educational, Scientific and Cultural Organization (UNESCO) and this year is observed on 24-31 October. The weeklong program closed by a Seminar on 'Media and Information Literate Cities: Voices, Powers, and Change Makers' at S.M. Nousher Ali Lecture Gallery in EWU campus on Tuesday. Beatrice Kaldun, the UNESCO country representative in Bangladesh, was the keynote speaker of the seminar while Dr Mohammed Farashuddin, Chairperson, Board of Trustees, EWU, was the Chief Guest and Kirsty Crawford, Project Director of Libraries Unlimited, British Council was the special guest. The seminar was chaired by Dr Dilara Begum, Associate Professor, and Chairperson, Department of ISLM, EWU. Beatrice Kaldun mentioned the importance of Media and Information Literacy in her speeches. She also suggested taking necessary initiatives to build Media and Information Literate Cities in developing countries like Bangladesh. Earlier, on October 24 the celebration started with colorful rally, balloons and cutting cake. Among other programs were an awareness campaign, quiz competitions, literacy game shows, and various competitive events also held to celebrate the week.